I am new here, and have what seems to me to be a rather advanced question (particularly for a newbie like me). My Pi is running the Lubuntu 16.04 LTS version of Linux. The RTC board has been plugged onto GPIO pins 1,3,5,7,9. The software support has been installed and activated, so it works OK.
What I am trying to do is: Add an Illuminated Power Switch that will power my Pi down safely. and have it still work? Do I have to tinker with something in the settings? If I can, indeed, move it to those other pins, the ones referenced by the Power Switch/LED articles become freed up, and should be a piece of cake to install. Barring that, is it easier to connect the LED and Power switch to other pins? I have attached the only wiring reference I have for the switch, and have used a 220 ohm resistor I got out of my CanaKit (Raspberry Pi Kit for Dummies) to the negative side of the built-in LED of the switch. Please let me know what other info I need to add here for coherent replies, and I'll gladly do so. More than a n00b, less than fully proficient. I think it would be easier to just use different pins for the switch and LED as they will work on other GPIO pins without any issues you just need to change the program to reflect your used GPIO pins. if you used GPIO 5 instead you would just need to change the code thus. Thanks for the prompt reply (and the code reference)! Is the referenced article(s) good, or are there better references for adding a Power Switch, and I just haven't seem them yet? There are probably more examples out there as to which are good or bad I don't know, if an example works for you the go with it. They try to pick a GPIO that's not commonly used. You can use any one you want to though, as mentioned above. 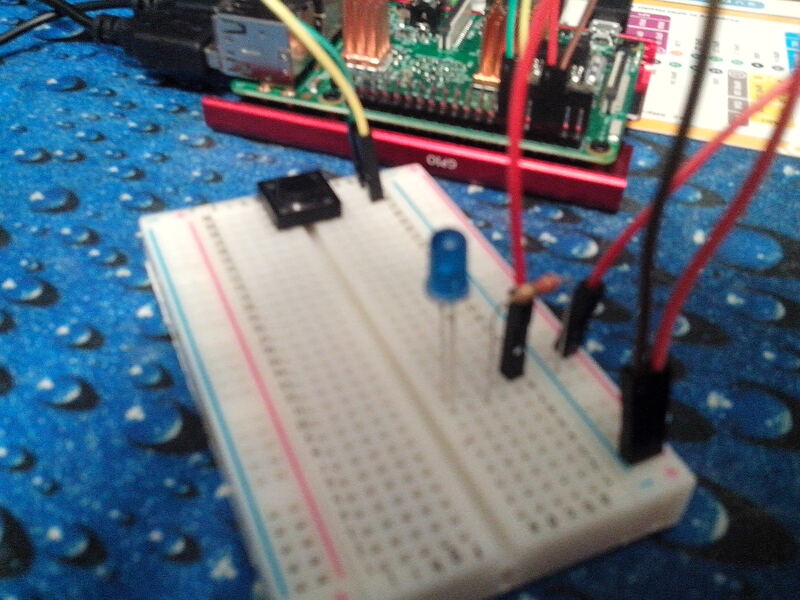 Look at three different tutorials and odds are good they each use a different GPIO pin. 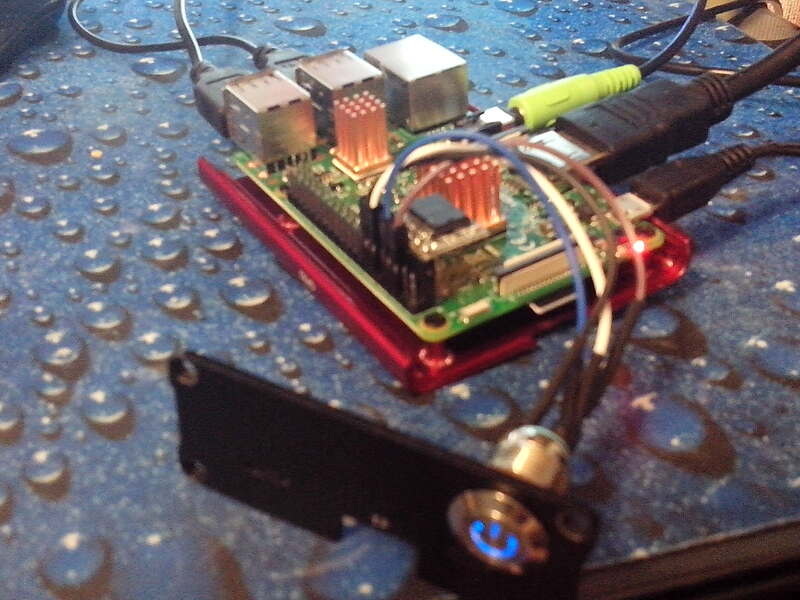 I have a DS3231 on several of my Pi's that run Raspbian. They use I2C for communication though. The author has you make a Scripts directory, then write the little Python script. After that, he has you add it to the list of programs to run on start-up. 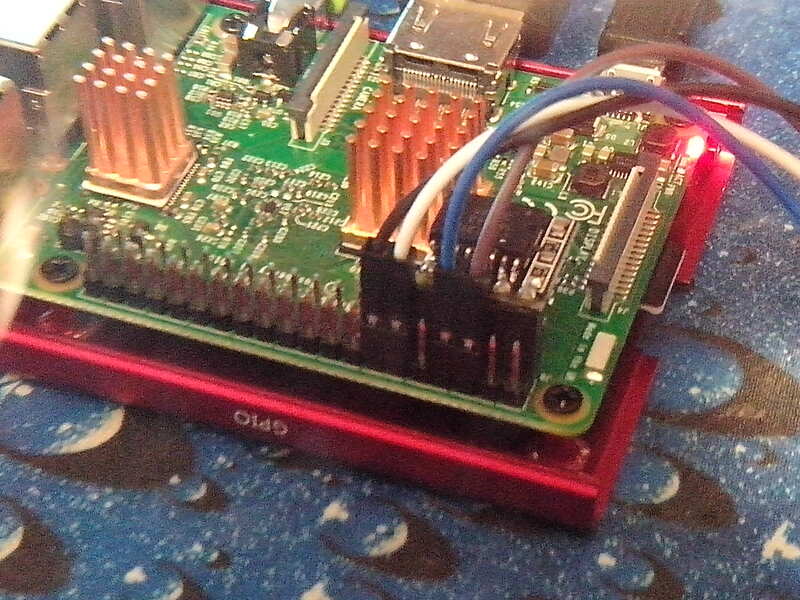 # Simple script for shutting down the RPi at the press of a button. # Setup the Pin with Internal pullups enabled and PIN in reading mode. # Our function on what to do when the button is pressed. # Add our function to execute when the button is pressed. After it boots up completely, I press the button. After a short pause, it shuts down! Save off the file and shut down. Now it's time to cross my fingers and boot up. The test LED lights up accordingly! So, all in all, a Great Success! To be fair, I had to debug my script, as I had a couple of typos in it and we all know just how finicky Linux Code can be, so I had to fix those to get it to work. To pcmanbob and alphanumeric: Thanks for the quick replies and encouraging posts! And the folks that provided the Raspberry Pi for Dummies Kit (CanaKit) and the useful bits and pieces in there. Let me just say this: I am glad I came here, and I hope others find this helpful. Looks like a fun place to find help and suggestions. If you folks want pics, and I can get away with posting them, just ask! P.S. If someone has more elegant code for this, Please let me know! I usually put my Pics in my Public OneDrive folder and then just post a link here. I put my Python files in /home/Pi. I run them via crontab. As with a lot of this stuff, its what ever works for you. Glad you got it all working and it sounds like you are on your way to being hooked on the raspberry pi welcome to the club. To post your pictures the way I use is to sign up to imgur.com its free. upload your picture there ( simple drag and drop interface) you can create your own album to put them in or just put them in your images folder. then you click on the image and to the right of it is a list of commands for posting the image just click on the copy button under the one that says BBCode and just paste the line in to your post here and your image will appear in your post when you preview it /post it. Hope that's clear if you need any help just ask. OK, I got myself an imgur account, and have uploaded the assortment of progress pics. For the record, I used the Forged Copper heatsinks: BMR-C1 (15x15x15mm) for the main processor, MOS-C10 (10x10x15mm) for the Ethernet Controller, and a 15x15x1mm "Copper Shim" on the bottom Memory Chip (Please feel free to correct me if I am wrong on the chip identification). 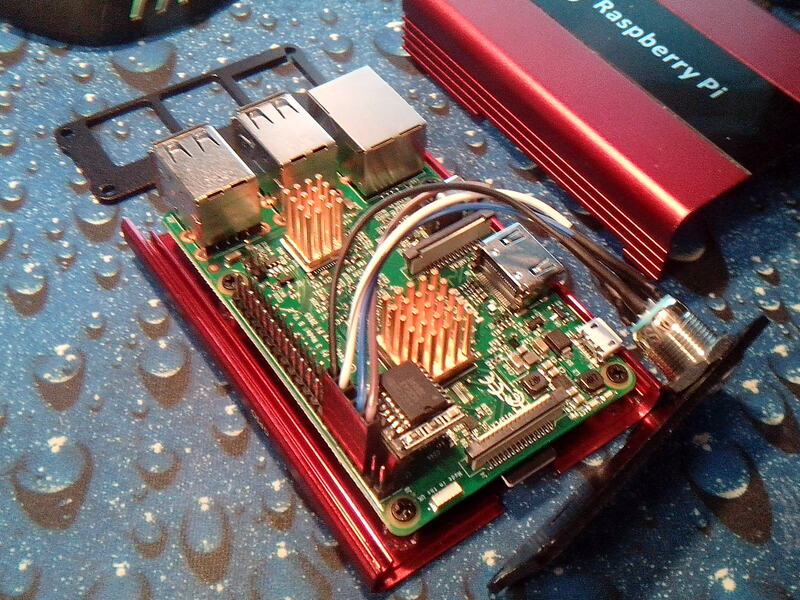 The case is an "eleduino" aluminum alloy case that comes with (rather puny) heatsinks. Beside the I2C Real-Time Clock module I have nestled the other connections, I found a 5 connector wide cable I had lying around from ages past, and transferred the single contacts to their corresponding places for ease-of-connection (leaving the center spot empty). Add to that, the strategically placed shrink-wrap tubing on the back of the switch, and I don't have errant contact situations to worry about. Something tells me, if I wanted the LED to shine more brightly, I could try removing the resistor. Right now, the less-than-blinding light is good for what might be used as a OSMC box from time to time. All in all, it's not too shabby looking, and doesn't come off as hacked together by a rabid 9-year-old. Nice looking project you have there. 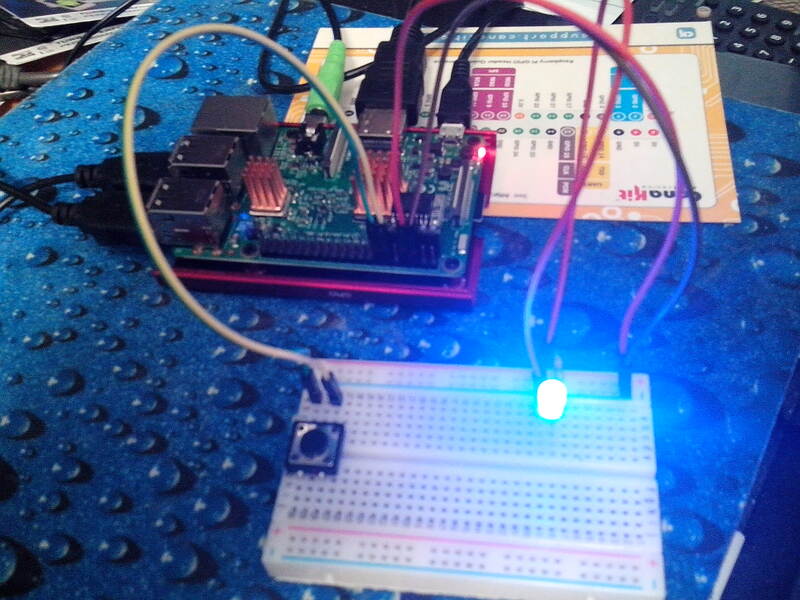 From your picture it looks like you used a blue LED, blue LEDs have a forward voltage of 3.3V and a forward current of 30ma max so you wont be able to drive it direct from the GPIO to full brightness, you would need to use a transistor which would allow you to power the LED from the 5v but control it from the GPIO. Looks really nice. I have 4 10mm LED's in one of my projects. Red, Yellow, Green and Blue. To get full brightness, and limit the current drawn from the GPIO I used this, https://www.adafruit.com/product/757 The GPIO are on the 3.3v side and the LED's on the 5V side. Four channels and four LED''s, worked out perfect for me. A lot easier and smaller than bread boarding my own circuit up. Overkill in your case, but the principle is the same. Darlington's and resistors. 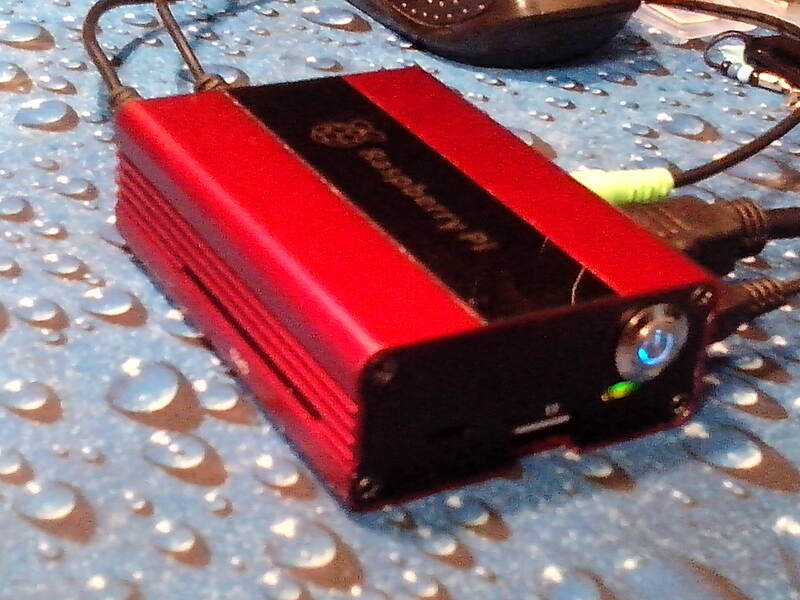 The 5V that feeds the LED's comes from my Power supply, not the Pi. Each LED has its own series load resistor so I can set the brightness I want.